This is another 'not quite crafting' book that I wanted to share with you all as some of you may know of the talented Jane Brocket from her lovely blog Yarnstorm or perhaps from one of her other books like the beautiful "The gentle art of domesticity". This book is a baking book with a lovely twist - all of the recipes have been inspired by descriptions of snacks and treats in children's fiction. 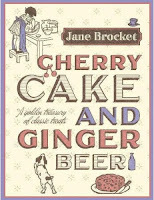 There are some really lovely recipes to be found in here, and with each recipe there is a short piece about the book it is from as well a short extract. The illustrations throughout this book use the original illustrations from the children's books featured and really give you a good dose of nostalgia. There are recipes in here for the famous Bruce Bogtrotter's chocolate cake (Matilda), Amy's pickled limes (Little Women), Strike-me-pink raspberry jam cakes (Mary Poppins) and so many more. Everyone who I've shown this book to has been fascinated by it and all have found something that they too want to have a go at making. My strongest recommendation for this book would be that all the recipes that I've tried so far have been a great success, and I really am terrible at baking. I'm the sort of person who can burn chocolate by trying to melt it in a microwave, I've had some real disasters with baking in the past but with this fantastic book I seem to have managed to turn that around. 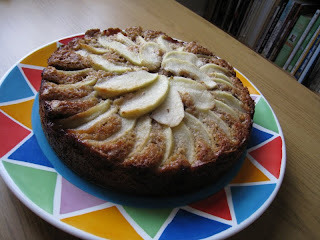 I started out by having a go at making the Chalet School Apple cake as I remember fondly reading quite a few of them as a girl. The cake was quite fiddly to make, but the well written instructions guided me through and I turned out of my oven a very moist and delicious apple cake (top right photo) that almost looked professional! High on the success of this I tried Mrs Glump's Melt-in-the-mouth shortbread and again ended up with some very tasty shortbread, the first batch disappearing quicker than snow in July and the second batch being very happily eaten by some of our neighbours. The recipe for coconut kisses (an easy way to make little coconut macaroon type treats) was also a great success, as was the two batches of ginger biscuits that I've done (and for which I have orders for more!). My most recent attempt has been the coffee and walnut cake (above left) which is heading off to my Mum's tomorrow so I'll let you know how successful it is once I've had a chance to taste it. To help save the cake from the snaffling hands of my husband I've had to take the precaution of baking up a mini batch of ginger biscuits to go in his 'snaffle jar' so hopefully there are enough there to keep him out of mischief for tonight! Edit: The coffee and walnut cake was a great success, so much so that I've just made another one to scoff at home today!